On November 24th SOUNDGARDEN will release a 3-CD rarities collection, titled Echo Of Miles: Scattered Tracks Across The Path. Among the set's seven unreleased tracks is a brand-new recording, “Storm” recorded in May this year with producer Jack Endino in Seattle. You can pre-order the album right HERE – available from Soundgardenworld.com in several exclusive bundles - to get an instant download of "Storm". For the first time, Echo Of Miles collects and curates all these “scattered tracks across the path”, offering a different slant on the 26- year history and evolution of one of alternative rock’s finest bands. The package has once again been beautifully designed by Josh Graham. 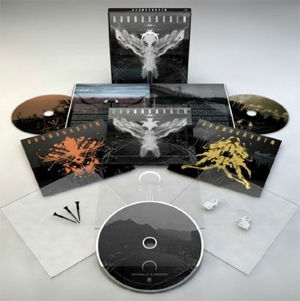 The set features three separate thematic discs in a clear plastic slipcase with three separate mini-jackets, each sporting its own unique art, a booklet and inserts, allowing you to mix and match your own album graphic layout. Disc 1, dubbed Originals, is filled with SOUNDGARDEN-written songs, mainly B-sides, in addition to two unreleased songs, “Kristi” and “Storm”. Disc 2, Covers, offers a stellar showcase of songs written by bands that SOUNDGARDEN love and admire, from THE BEATLES, ROLLING STONES, THE DOORS, THE STOOGES, RAMONES and DEVO. Disc 3, Oddities, offers instrumentals, remixes and demos, including Steve Fisk's unreleased “The Telephantasm (Resurrection Remix)”, “Twin Tower” penned by Matt Cameron, which was originally recorded at Seattle’s London Bridge studio in December 1988 during the sessions for Louder Than Love, and “Night Surf”, an instrumental performed by bassist Ben Shepherd.